The Chesapeake City Ferry operates from April through October. The ferry service provides a vital link between Chesapeake City’s North and South sides. The service for bicyclists and pedestrians will run Thursday through Sunday. Boardings cost $3 per person each way, $5 round-trip, including bicycles. One-way trips take five to seven minutes to complete between the City’s south side dock – Chesapeake Inn, to the ferry landing on the North side – Schaefer’s Canal House. It is a straight shot about 600 feet across the C&D Canal. 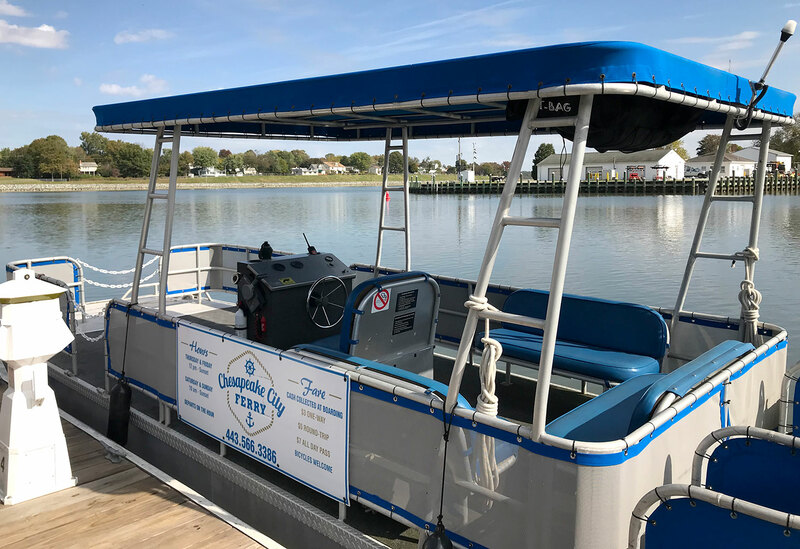 Our Ferry and Water Taxi vessel can hold up to 6 passengers. If there are more than 6 people in your party, our captain will make multiple trips. From the North side ferry landing, passengers have walking access to Schaefer’s Canal House as well as the newly completed, Ben Cardin and Michael Castle Canal Trail. 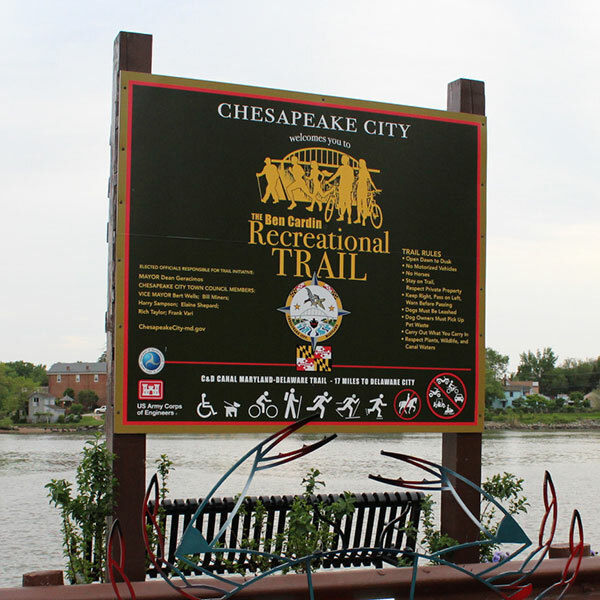 The trail begins at the north side ferry landing and stretches approximately 14 miles along the canal, ending in Delaware City. Bicycle racks are available at the Trail Entrance on the North Side. From the South side ferry dock, passengers are in the heart of Chesapeake City’s historical district. The town has many restored historic homes, shops and galleries, antiques and more! There are also many fine restaurants and bed & breakfasts. Cash collected at boarding or at our Ticket Booth located on the South Side Dock. Beginning on April 15th 2019! Saturday and Sunday from 11:00am until 5:00pm. Departs on the South Side of Chesapeake City on the hour. You can expect the Water Taxi to arrive on the North Side a few minutes after the hour. Please call +1(443) 566-3386 with additional questions or to contact Water Taxi Captain for pick-up. Full 2019 Season Schedule will begin in early May. *Schedule may change with little notice due to weather conditions and/or marine traffic. Safety is our main concern – CCWT Crew & Management. Please support Chesapeake City businesses and attractions.